Heat oven to 350°F. Grease 13x9-inch (3-quart) glass baking dish with shortening or cooking spray. In small bowl, mix 1 cup Bisquick mix, the nuts and brown sugar. Cut in 3 tablespoons firm butter with fork or pastry blender until mixture is crumbly; set aside. Spread apples in baking dish. In medium bowl, stir remaining filling ingredients until blended. Pour over apples. Sprinkle with topping. Bake about 55 minutes or until knife inserted in center comes out clean; cool slightly, about 30 minutes. Serve warm if desired with ice cream. Try these favorite varieties of apples for baked pies and desserts: Empire, Regent and Spartan. 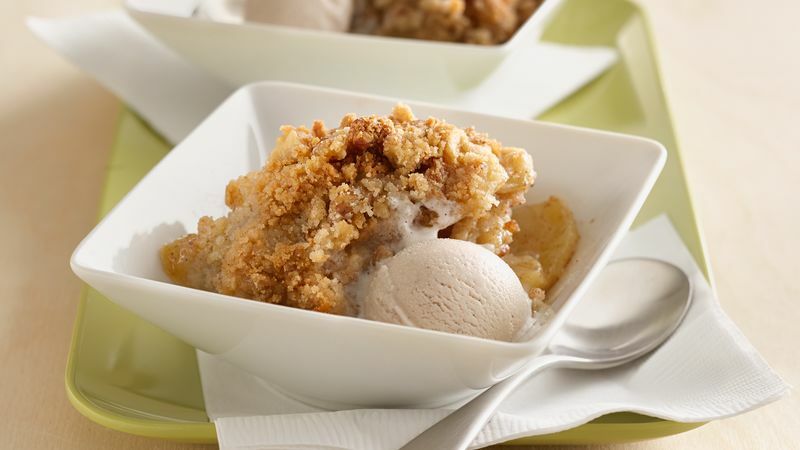 Top this yummy apple dessert with scoops of frosty cinnamon ice cream!